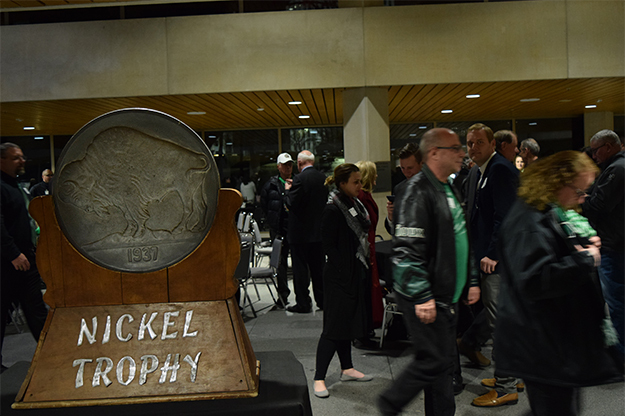 The Nickel Trophy, which headlined the rivalry between UND and NDSU football teams for decades, retired on Monday (Dec.3), in the State Heritage Center in Bismarck. Photo by Dima Williams/UND Today. 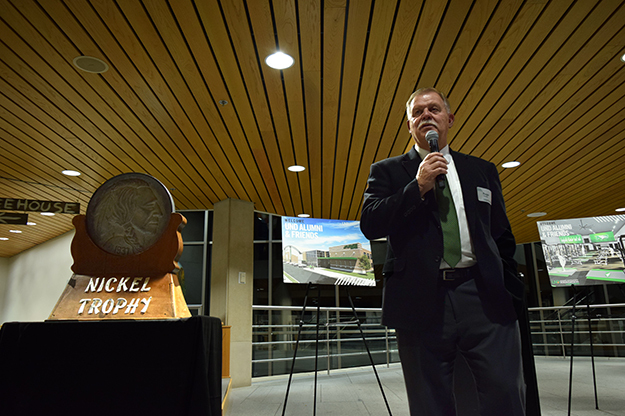 Ostensibly the most precious of coins in North Dakota found its forever vault on Monday (Dec.3), when the Nickel Trophy retired inside the Heritage Center and State Museum in Bismarck. A bevy of guests, including University of North Dakota alumni – among them North Dakota Supreme Court Chief Justice Gerald VandeWalle – gathered to send off the coveted keepsake. Poised on a wooden plinth, the trophy embodies one of the longest rivalries in college football – between UND and North Dakota State University. “Minted” by the Blue Key honorary societies at NDSU and UND, the Nickel is a 75-pound, aluminum-alloy replica of an early-1900s 5-cent piece, rendered by famed sculptor James Earle Fraser. The Nickel has been in circulation since 1938, when NDSU claimed it for the first time in its 17-13 triumph over UND in Fargo. Back then, the coin’s side engraved with a bison, NDSU’s mascot, rose victorious. In the next 65 years, however, the other side – graced with a Native American’s profile in a nod to UND’s old Sioux logo – got to bask in the winning limelight quite often too. In their much hyped matchups during regular seasons, NDSU and UND have each pocketed the Nickel for stretches of 12 straight years. UND leads the possession count 35-30. Today, the Nickel Trophy is neither UND’s nor NDSU’s. Although it continues to carry the athletic legacies of both institutions, it is now truly North Dakota’s. “I grew up in North Dakota and the Nickel is just such a big part of us,” said UND football head coach Kyle “Bubba” Schweigert. Scores of UND alumni and fans lined up to snap photos and lift the 75-pound keepsake, as it made its first public appearance for nearly a decade. Photo by Dima Williams/UND Today. 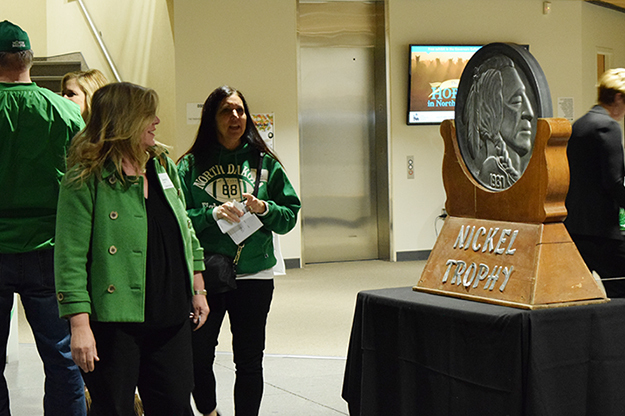 The Nickel’s arrival at the Heritage Center marks its first public appearance in nearly a decade, after it rolled across the state in celebration of UND’s 125th anniversary in 2008. 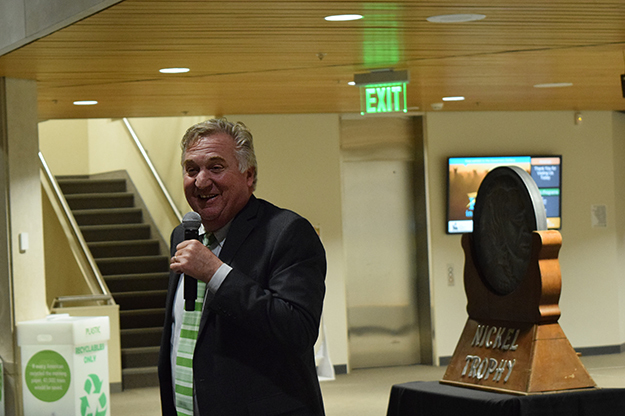 “I am very excited that it is us giving the trophy to the Heritage Center because the last team to win it was the University of North Dakota,” said UND President Mark Kennedy to booming applause at the retirement reception, organized by the UND Alumni Association & Foundation. The trophy tumbled into UND’s hands in 2003, when the two universities played each other for the last time – their 110th meeting – as part of the North Central Conference (NCC). The finale of the Nickel Trophy series thundered with loaded expectations and aspirations. Both teams entered the gridiron of the Alerus Center with solid records (UND was 5-1 at the time) with desires to ascend to the playoffs. Although UND enjoyed what seemed like a comfortable lead of 21-7, the game leaped into overtime. After TV-worthy runs – including a 69-yard touchdown by UND receiver Travis Lueck – UND claimed the trophy and eventually progressed to the finals. UND football head coach Kyle “Bubba” Schweigert still remembers the giddy feeling of winning the Nickel in the 2003 game against the Bison. Photo by Dima Williams/UND Today. “I will never forget that day,” Schweigert said. A year later, NDSU began its transition into Division I, a reclassification that rendered UND-NDSU games nearly impossible to schedule. 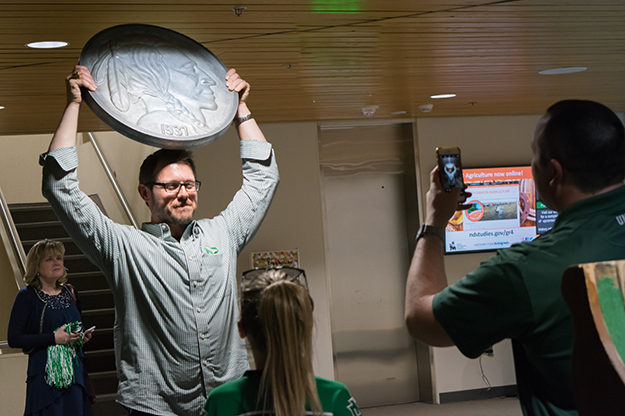 Years later, UND embraced its Fighting Hawk identity, leaving half of the giant coin obsolete. Hence, when the two teams faced off again in 2015, the coveted prize remained on the sidelines. Yet, the Nickel Trophy has rarely departed its coveted position – at least metaphorically, in the psyche of the two universities. In reality, though, the prize has fallen victim to a number of gasp-provoking robberies. 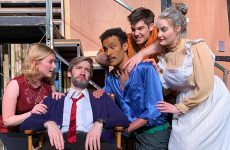 In 1997, for instance, NDSU students slid into UND janitor uniforms to arouse no suspicion as they strolled to the players’ lounge in Memorial Stadium and stole the trophy. Then, they took it on a country-wide trip with stops at Mount Rushmore and Niagara Falls. A year later, UND retaliated with a plot that could have easily spawned a spy thriller. Duping NDSU administrators, several UND engineering students obtained the blueprints for the Bison Memorial Union, where their Fargo-based enemy exhibited the trophy. After a few reconnaissance missions, the thieves-pranksters sneaked into the building. Crawling through the air ducts and radioing their peers keeping guard outside, they lifted the Nickel Trophy away. Former UND football head coach Roger Thomas shared his recollections of one of the most brazen thefts of the Nickel Trophy. Photo by Dima Williams/UND Today. As the next rivalry game drew closer, however, anxiety saddled both campuses – “where was the Nickel?” former football head coach Roger Thomas reminisced. 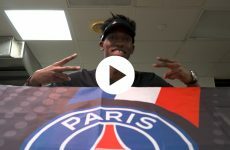 With mere days left until kick-off, Thomas learned the answer when a student stopped by his office. Refusing to reveal his name, the student agreed to place the trophy inside the door of Memorial Stadium the following morning. Because of the constant off-field battle over the Nickel Trophy, its whereabouts in the last decade have amounted to top secret at UND. Photo by Dima Williams/UND Today. Because of the constant off-field battle over the Nickel Trophy, its whereabouts in the last decade have amounted to top secret at UND. 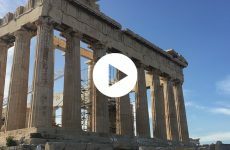 Rumor has it that it has resided in various, nondescript locations along University Avenue as well as the homes – and perhaps vehicles – of athletic coaches and officials. Today, the speculations have dissipated. The Nickel Trophy is to rest in plain sight at the Heritage Center for revelers to relish. But UND has one last task. “We need to make sure it is displayed the right side out,” quipped UND Alumni Foundation & Association CEO DeAnna Carlson Zink.